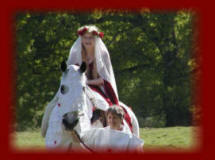 Lady Lorraine ad Lord Robert wished for a fairytale medieval wedding and a fairytale wedding day they definitely had. After 18 years they decided to tie the knot at the breath taking venue of Knepp castle with a blue bell covered wood and lake as the main view from the tent. 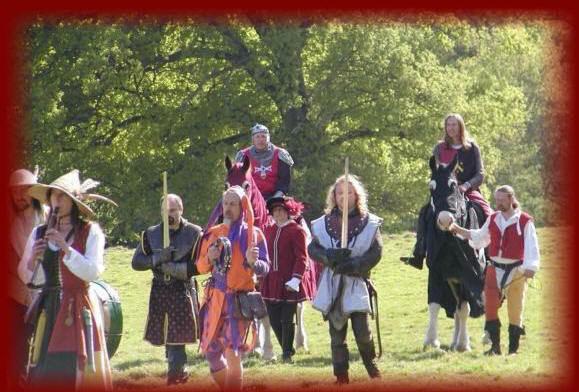 They wanted to go the whole way with men at arms, all medieval tentage, medieval entertainment, arrival on horse back and medieval hand fasting ceremony, with non stop entertainment. 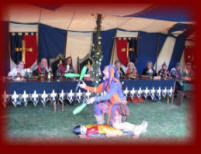 with fighting knights medieval minstrels and the royal fool who performed a stunning fire show. The guests excelled and dressed to compliment the theme. It was an emotional day and it just had to be right including the weather yes again the sun shone brightly in April!! 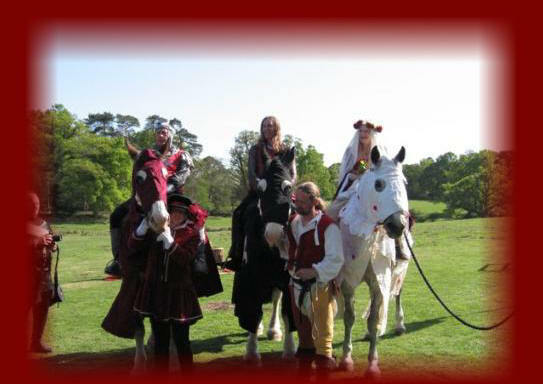 With their men at arms the overjoyed couple looked every part the medieval Lady and Lord for their special day when they arrived on horse back. It was an honour to do this for them. 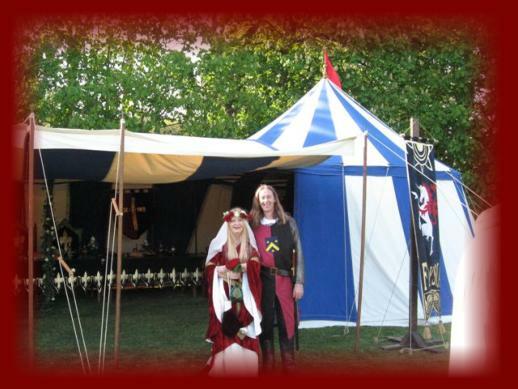 For a special 50th birthday surprise we bestowed upon her the title of Lady Lorraine an English feudal title, The look on her face was a picture and well worth the secret she was lost for words. 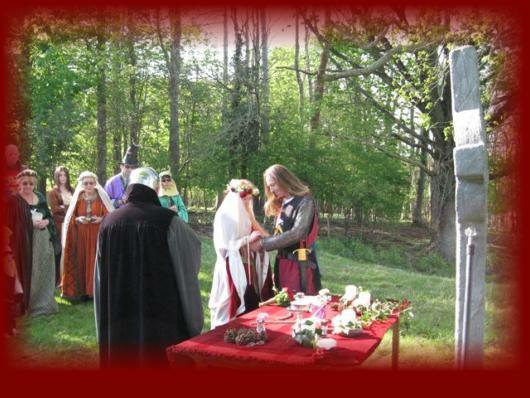 Not only did they have a legal ceremony in Horsham but they also had a hand fasting on arrival, and a twilight ceremony beneath a large oak tree by torch light, with their guests gathered around. The night ended with a kissing cake ceremony and Lorraine cutting her 50th birthday cake. As the night closed in the guests could not believe they had been to a wedding as different as this. 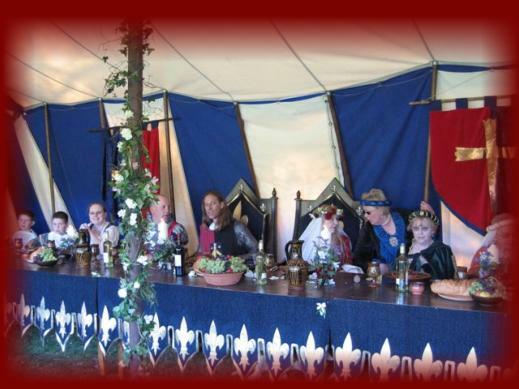 Words cannot express our gratitude to you for making our dream medieval wedding day come true I could not have organised such an incredible day with out you Val and I cannot believe you pulled it together in such a short time. Our wedding was truly unique and it felt like we had stepped back in time hundreds of years into the past. 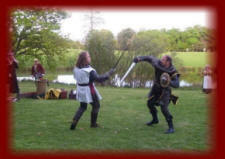 Children played adults had fun and the food and entertainment and theming was incredible. I cannot believe the gesture you also made of making me a lady for real. Being handed the title took my breath away and still does when I think about it. We are being heralded for having such a spectacular day and unforgettable wedding Guests are still asking for more photographs and all want to copy us and have a themed wedding, A million thanks to you and the superb team you have to make our day so special. We will call upon your services in a year and a day as we must by medieval law to renew our vows again.